Climbing Mt.Triglav is always an amazing experience. 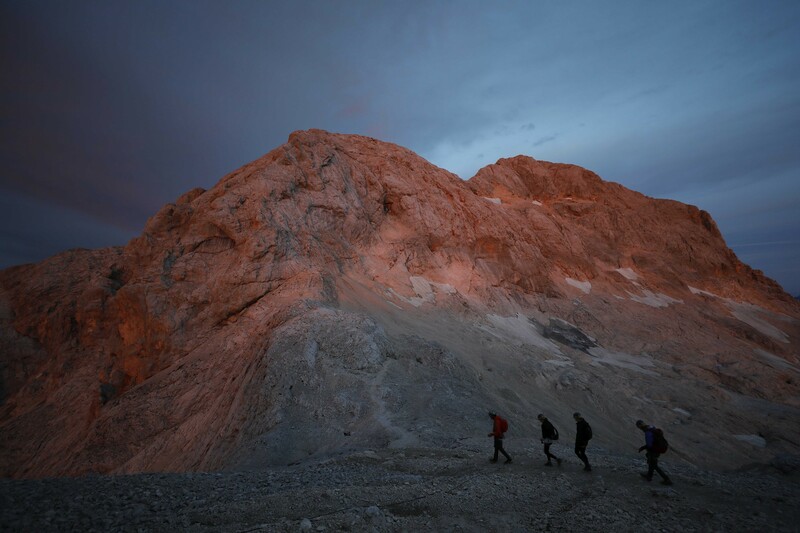 The highest peak of former Yugoslavia is offering amazing views all the way to the Mediterranean sea, Julian Alps and Karavanke range, Austria, Italy and Croatia. The route is scenic and diverse, taking you from the glacier valley through the lush forests, mountain meadows to the kingdom of rocks. The route is a perfect combination of nice hiking trails and via ferrata climbing at the top. Tasting great local food and listening about the legends connected to this area will add this special something to the experience. It is suitable for everyone who wishes to climb Mt.Triglav, meet new people and enjoy the beautiful Julian Alps. If you don’t feel like hiring a private guide, climbing on your own or just wish to save some money, you can join a small group for 2 days and climb Mt. Triglav in great company. The price includes transfers from Bled, Kranjska Gora and Bohinj, IFMGA professional guide and technical equipment (via ferrata set, climbing harness and helmet) Half board at the hut costs around 40€ per person and is not included in the price. Based on experience and our love to the area we chose a perfect route for you! The starting point for this climb is in one of the tree glacier valleys around Triglav - The valley of Krma. You will slowly climb up from the tree line to the mountain meadows with cows and shepherds making your way up to the rocky slopes and Triglavski dom na Kredarici, the highest mountain hut in Slovenia. Spending the night at 2515m above sea level, admiring the sky full of stars, first sunrise and last sunset in the area and enjoying a nice traditional meal in a great company is an amazing experience. From the hut to the top of Mt. Triglav leads a via ferrata route. You will be using harnesses and helmets, your guide will secure you with a rope the whole time. Depending on weather conditions and fitness of the group you will climb to the top of Mt. Triglav on the first day in the afternoon or the second day in the morning. You will walk/climb for 12-18 hours in 2 days. We wish to catch the best weather for you, so we will let you know the exact time you will start your adventure one day before the climb.